Head-on train crash in Germany. 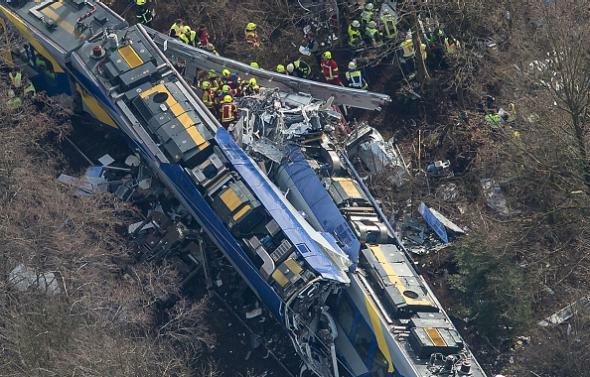 The site of a collision between two trains in southern Germany on Feb. 9, 2016. The trains collided at a bend on the Mangfall Valley Railway, a single-track regional rail line between the towns of Rosenheim and Holzkirchen, German Transport Minister Alexander Dobrindt said. “There’s a curve there, so we must assume that the train drivers must not have been able to see each other beforehand,” he told reporters at a news conference. The crash occurred at 6:48 a.m. local time. Both drivers are believed to have been killed. It’s not yet known whether it was a technical or human error that led to both trains being on the same track; the Guardian says both were equipped with automatic brake systems that should have kicked in when/if their drivers failed to stop at a red light signal.